Pakalert Press » WTC demolition participant murdered? 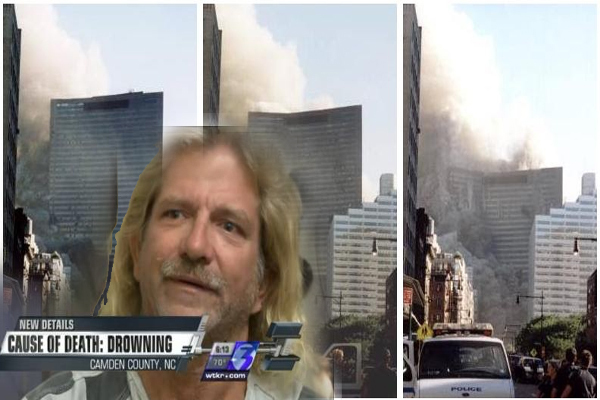 Was Michael Calabrese murdered to prevent him from talking about his participation in the controlled demolition of the World Trade Center Towers and Building 7? That is the explosive charge leveled by an anonymous source calling himself “Dave Adam.” According to former NSA officer turned whistleblowing journalist Wayne Madsen, “Adam” fears for his life in the wake of Calabrese’s apparent murder. In an exclusive interview with Truth Jihad Radio, Wayne Madsen explained that pseudonymous source Dave Adam came forward during the past two weeks, apparently first contacting Architects and Engineers for 9/11 Truth and then Madsen. According to Madsen, Adam “claimed he was involved in placing vending machines containing detonation and relay switches inside the North and South Towers of the World Trade Center” and that Calabrese, a former Navy Seal, was part of the operation. Calabrese was found dead on May 24 2012, floating in a harbor in Camden, North Carolina. The odd thing was that his body was floating vertically, not horizontally, indicating it had been weighed down. Though Camden County Sheriff Tony Perry called the death “suspicious,” it was officially ruled an accident. Dave Adam claims that he worked for Calabrese as part of a CIA-linked special operations team that flew in from Montana’s Malstrom Air Force Base, operated out of Military Sealift Command Atlantic in Bayonne, New Jersey, and placed detonation relay switches in vending machines in the World Trade Center Towers. Madsen pointed out that some of the E-Team and Gelatin “art students” – like the hundreds of Israeli spies disguised as art students swarming all over the US during the run-up to 9/11 – used fake credentials from nonexistent art schools. Madsen noted that Jeb Bush, who was governor of Florida in 2001 and personally participated in the cover-up of the Israeli spies, Arab patsies and fake flight schools, is expected to announce his candidacy for president soon – which should bring renewed attention to his nefarious activities in 2001. So Dave Adam, if you’re reading Veterans Today right now, please get your story out in a complete, definitive, non-anonymous manner and stay safe! I guarantee that if you blow the 9/11 case wide open, Alan Roland will be happy to help you with his highly effective therapy for overcoming PTSD. And by lancing the suppurating boil of 9/11 with the sharp needle of truth, you’d also be helping your country overcome the possibly terminal case of PTSD it’s been undergoing during the past 13 years. It’s amazing that they have to suicide all these participants, when the evidence is as clear as day. All of the photos show the clean cuts on the beams that remained standing. It looks like a saw or torch cut them.